Bradley Harris, Kiernon Lannon and Joshua Ruff. Smithtown. Mount Pleasant, S.C.: Arcadia Press, 2009. Illustrations. Pp 128. ISBN: 0738564532. $21.99. 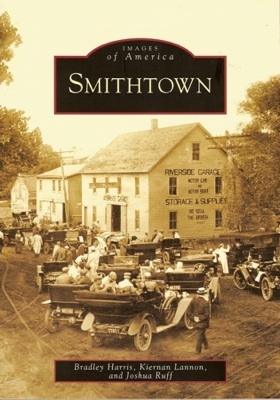 The Township of Smithtown deserves recognition for its own story, and this book is ably put together by three authors who keenly know and embrace their subject. Settled in 1665, the town’s name derives from its founder, Richard Smythe. The legend of him riding a bull around his lands is often better known than his actual name. His nickname, “Bull” Smith, might be better known. In any case, the authors have included in their introduction a brief history of the town, including a discussion of the background behind the well-known, fictitious tale. After all, the bull is still very visible on the Smithtown seal, and certainly the statue at the intersection of Routes 25 and 25A has attracted the attention of drivers, not to mention fun-loving teens, for generations. This book’s overview of Smithtown includes its Native American forebears, as well as its industrial, educational, commercial and agrarian histories, well into the twentieth century. The book’s images begin with the oldest scenes of the early pastoral life in Smithtown, as conveyed by the artist Alexander Milne, in about 1850. Using the artist’s interpretation allows the reader to experience the community prior to the common use of photography. One can contrast the painting of the Presbyterian Church in the beginning of the book with the circa 1910 photograph in chapter five and the 2008 photograph near the end of the book. Those three images alone clearly reveal one-hundred-fifty plus years of growth, transition and lifestyle change. The remainder of the first chapter depicts some of Smithtown’s earliest structures, both private residences and commercial buildings. The reader is treated to two interior photographs of private homes, illustrating the décor and lifestyles of their owners. All photographs have descriptive captions which not only explain the photograph, but add historical and biographical information. Continuing on, we learn about the people of Smithtown. Starting with the early years of photography in the 1860s to a Historical Society event in the 1980s, readers can view the fashions, hairstyles, pets, pastimes and pursuits of the town’s residents. The authors are careful to include not only the Smith family, but other names of prominence in the area such as the Lawrence, Blydenburgh, and L’Hommedieu families. It is here that the reader is introduced to photographs that also show the diversity that evolved in Smithtown as it evolved. People from the areas of San Remo, King’s Park, Smithtown Branch and Head of the River are featured, as well as groups that include the St. James Fire Department, Sons of Norway, the Society of St. Johnland and Save the Children Federation. Each of these areas and organizations contributed to the social history of Smithtown, and the photo captions reward a reading in their entirety, a credit to the authors. Of course, “Getting There” is the chapter that really explains the growth of Smithtown. Photographs of early dirt roads and transportation limited to a horse or a boat make it understandable how Smithtown remained so pastoral for over 150 years. Five full pages are dedicated to the arrival in the 1870s of the Long Island Railroad. This brought people into, and farm products out of, Smithtown. The railroad eventually assigned four stops within the town: Kings Park, Smithtown, St. James, and Flowerfield. Unfortunately, there is no photo here of the still standing 19th-century St. James Railroad station. Thankfully the bicycle craze and the advent of the automobile are illustrated. Readers will find a treat in this chapter as they view a 1927 photograph of Charles Lindbergh’s airplane flying over Hauppauge after leaving Roosevelt Field on his first solo transatlantic flight. The fourth chapter is chock full of photographs of hotels, businesses, and the inevitable arrival of industry and commerce. The progress illustrated and described is reflected in the following chapter, “Prominent Landmarks and the Changing Landscape.” Beginning with an 1874 sketch by Edward Lange and reaching into the 20th century, the photographs include many large estate homes, which were prevalent in Smithtown’s landscape as well as municipal structures and the Kings Park State Hospital and the Veterans Memorial Hospital. Since Smithtown has long been a place where residents enjoyed a second home or spent their summers in proximity to the beach and open air, it is fitting for the authors to devote an entire chapter titled “Kicking Back” to leisure activities. The coming of the railroad brought many summer visitors to Smithtown, and its vast open land invited those who could afford it, to construct estates. The year-round population joined in and outdoor sports of all kinds are seen in photographs. The area itself, with miles of beachfront, the Nissequoque River, and open meadows lent itself directly to staying outdoors to enjoy its amenities. The photos of equestrian events are indicative of both a longtime passion espoused by Smithtown residents and the realization that the open land required for this pursuit has dwindled so much that many of today’s accomplished riders have never had the pleasure of riding outside of a fenced ring. It was gratifying to see the southern part of Smithtown included in this chapter, with mention being made of the hamlet of Nesconset and the northern section of Lake Ronkonkoma where the lake attracted bathers in the summer and ice boating in the winter. The photo of Hollywood Beach, so evocative of the summers on Long Island during the 1950s, is, it should be noted, not located in Smithtown. The last chapter brings the reader to the present, with a narrative of the familiar post-World War II story of the expansion of suburbia into Smithtown. The population increase required new homes, businesses, roads, and schools which changed the landscape drastically. The authors credit Smithtown’s residents for springing into action before all of its history disappeared. It was the foresight of these volunteers who enabled all who pass through, or live in Smithtown, to still see how it once was. Reading Smithtown will engage readers to learn about its families, architecture, growth, development, and history.